Parents and community leaders are increasingly concerned over gang violence in Khayelitsha which they say has resulted in 20 stabbings, two of them believed to be fatal, over the past four weeks.The enmity between the Italians in Khayelitsha Site B and the Vato-slokos in Sections A to G erupted a year ago over a stolen cellphone, but has lain dormant until flaring up again recently. About 100 residents from Khayelitsha D-Section convened a meeting on Thursday afternoon in an effort to resolve the escalating violence but nothing was resolved during the two hour meeting, resulting in a decision to meet again on Sunday. In the latest incidents, on Monday June 20 a 16-year-old known as ‘Nzola’, from Site B’s Y-Section, survived being stabbed four times in his back, once in his right side and in his hand by a marauding group of about 50 Vato-sloko gang members. His mother, who refused to provide her surname, said her only son was on his way home after soccer practice when he was attacked in the street. She said she saw the attack occur. “I heard him screaming outside. When I rushed out I saw lots of young men stabbing him and he was fighting back. “I couldn’t believe it, watching my son being stabbed like that. I thought he was going to die. She said the group ran when they saw her phoning the police on her cellphone, however, she said the police never arrived and she went to the Khayelitsha Site B police station later that evening to lay a charge but received no assistance. She said the police told her they would come take a statement from her at the Site B hospital where her son was being treated, but again, they never arrived. Speaking on Thursday, she said her son was still in the provincial hospital and the police had not taken a statement from her or her son. On Wednesday, the Italians staged a revenge attack in Vato-sloko territory. During the community meeting on Thursday it emerged that at about 8pm on Wednesday about 20 Italian gang members went to a Somalian-owned shop in D-Section in which six young men from the area were buying goods. Residents said members of the Italian gang switched the store’s lights off and started attacking the young men in the shop. During the fracas one of the young men was stabbed in the back. At the meeting residents said parents were having to lock their children inside their home at night and some places were becoming no-go areas. In the wake of Wednesday’s attack spaza shops were closing early as attacks tended to occur in the evening. The violence was also affecting pupil’s performance at school. Grade 10 pupil at Bulumko High in F-Section, Mandisa Sithole, said she did not write her exam paper on Friday last week as she was stopped by gang members while on her way to school. A teenage Vato-slokos gang member, who identified himself only as “Mabra-slokos”, said the gang war started over the theft of a Samsung E 250 cellphone over a year ago. The E 250 is an outdated cellphone without any particular features. “Those guys from Site B stole my phone and then beat me. I couldn’t let it go. I told my friends. We went there to get it back, then we beat one of them, so they came back with knifes, pangas, and bottles. They chased us and four of us were stabbed and two died. 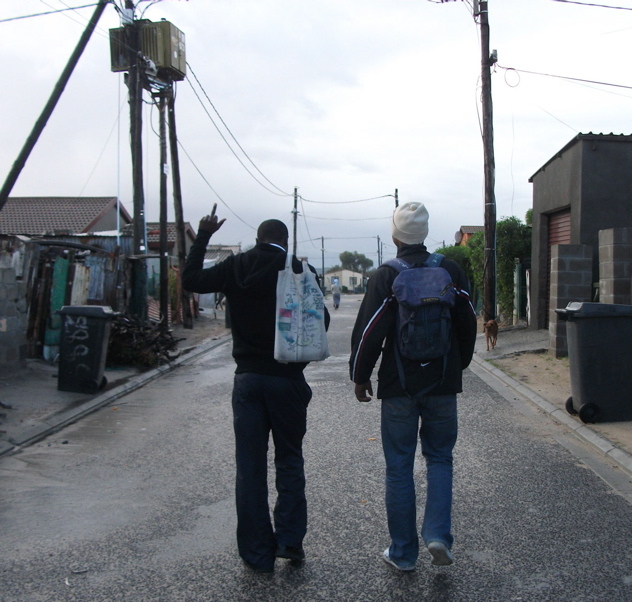 When we saw some of us were dying we called other areas from Khayelitsha to assist us and we formed a gang called Vato-slokos. “This is a war and it’s not going to end until one side ends. Last year we stopped because we were dying but Italians started it again and we’re ready for them. We kill, they kill,” he said. A member of the Italians gang, who identified himself as ”Voora” said the cellphone was originally stolen from one of their own members and they went to get it back. However, Voora said the Italians wanted to fighting to stop. “We want this to stop because it’s affecting innocent people. Some can’t even go to school because of fear. He said the problem was that the Vato-slokos were attacking people indiscriminately. Site B Sanco Chairperson Unathi Mabengwana confirmed the incident on Monday when a 16-year-old was stabbed. He said a meeting with the boy and police would be organised and “hopefully we will find a solution”.